In the State of Hockey, taking it outdoors and playing on a frozen lake is the ultimate grass roots experience that needs to be included in your hockey schedule this year. The AF99 Pond Hockey Classic is an annual tradition that will create memories of a lifetime. Spring Lake Park sits just below the bluff in beautiful lower North Mankato and is a wonderful setting for pond hockey. The Anthony Ford Pond Hockey Classic takes place on Saturday, January 26, 2019 (Adult play) and Sunday, January 27, 2019 (Youth play). We feature 12 expanded NiceRinks on a great pond that is sheltered from the wind. This is not a USA Hockey or Minnesota Hockey sanctioned event. The event is free to the public and includes viewing from the pier, a sledding hill for kids, hospitality area serving food and refreshments including beer and wine, warming houses and plenty of parking. Teams of all levels are welcome. Enter off Hwy. 169 at Webster Ave.(by Best Western) Follow Webster Ave. Take a left at Sherman St., 1block then Right on McKinley. Parking is also available off Webster Ave.
Click on "DIVISIONS" link above for more information before registering. • No Refund for weather-related issues. You may receive credit for next year. 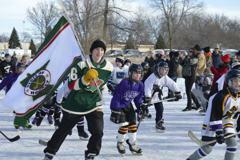 At the Anthony Ford Pond Hockey Classic, we promote a fun and competitive day at the rink. After your manager registers your team, check out the warming houses and hospitality shelter. We will be serving food and refreshments including beer & wine. In pick-up hockey fashion, there are written and unwritten rules. We expect the players to decide the right way to play the game. Please be prepared to engage in a positive display of honesty and integrity. Divisional play is an important part of a great game day experience. We will do our best to provide divisions for all ages and skill levels. 4 team minimum and 12 team maximum for each Division. For more information, click on Divisions tab. Game officials will be provided. Their priorities, in order, will be 1. keep score 2. start/stop game 3. keep an eye out for fair/unfair play. The expectation is ultimately for the players to respect and adhere to the rules of the game. For more information click on the Pond Hockey Rules tab. Although weather ultimately dictates conditions, we feel our lake provides exceptional pond hockey rinks. We have 12 rinks with the latest professional NiceRink boards. Our small pond is sheltered and it freezes fast with less cracks. We will be flooding prior to both events and will do our best to have good ice. Thank You for participating. What a great way to support a worthy cause! Create your very own back yard ice rink! We want to hear from you. Your comments and suggestions will help us improve your game day experience. Click the link below to make a comment. All reasonable suggestions will be considered. Questions on Sponsorships? Contact Daniel Sprague at (507) 380-2718 or e-mail Dan at daniel.j.sprague@wellsfargo.com.